miscellaneous information. These three areas are discussed as follows: 1. Patient Information: The specific information required is the patients name, rank, SSN, duty station, mailing address, and military status. This information is required to establish eligibility and provide the requesting activity with an address for the patient upon receipt of the completed eyeglasses. 2. Prescription Information: Since the spectacle prescription is the technical portion of the order form, you should complete it with great care, ensuring that the prescription is transferred in its entirety. The essential elements of the prescription are interpupillary distance, frame size, temple length, plus and minus designators for both sphere and cylinder powers, segment powers and heights, prism, and prism base. It is not necessary to calculate decentration in the single vision or multifocal portions of the order. It is also unnecessary to try to transpose any prescription into plus or minus cylinder form. 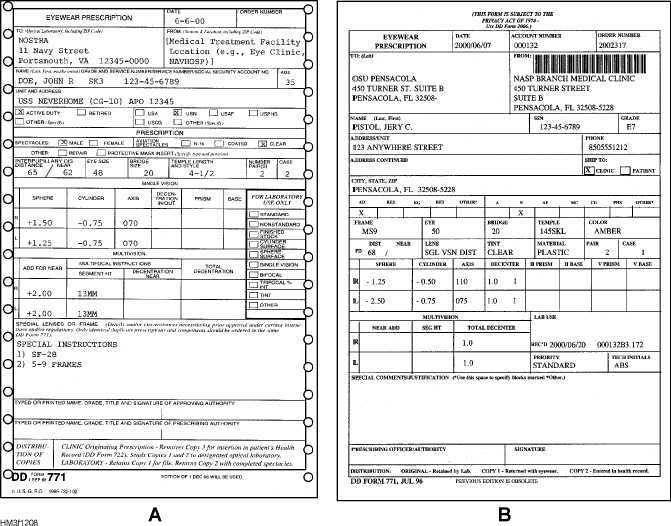 Leave the prescription as is, copy it onto the DD Form 771, and note in the remarks section that the prescription has been copied and is in the HREC. 3. Miscellaneous Information: This area is reserved for any information you feel the Navy Optical Laboratory may need. Information the laboratory may need includes special fabrication requirements, such as multifocal lenses, or proof of eligibility for specialized eyewear, such as aviator sunglasses. Standard issue items can be determined from NAVMEDCOMINST 6810.1, Ophthalmic Services. DD Forms 771 should be typewritten or computer printed whenever possible. This practice eliminates 12-23 Figure 12-8.Eyewear Prescription, DD Form 771: A. Computer-printed edition; B. Computer-generated edition.